I've never been a huge Pedro Almodovar fan. Some of his early films, like Pepi Luci Bom, or Kiki, or Tie Me Up Tie Me Down were like watching a Spanish John Waters film with a late 80's Kid and Play sensibility. Nu-uh, is what I said to all that. Talk to Her is different. From this point onwards, Almodovar seemed to be a director with a sensibility and with something to say. And after last week's Zombie-fest, we at Film Club think that alone is worthy of celebration. We'll be screening Talk to Her at Boa Taverne Modern after 8:30pm this Monday night. Free admission. Popcorn and drinks available for your consumption. The story of two very strange and unlikely friends who bond while caring for women in comas is both very surreal, and at the same time restrained. The premise is flamboyant and outrageous, but the execution marks the hand of a director who no longer needs the cha cha chas, the goofy sexual triple entendres, and the wacky color palette of a Spike Lee Joint. Instead Talk to Her delves into the male psyche in such a way as to elicite feelings of empathy and identification with characters whom we wouldn't hesitate to describe as 'creeps' in the real world. It's an analyst and filmlover's dream. Since my dad is a psychiatrist, and I am a frustrated filmmaker and cinephile, and sometimes a creep -- this film is right up my alley. (Wonder what Freud what have to say about my choice of words there, tee hee). 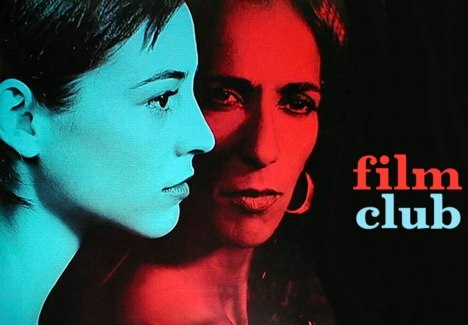 Anyways, with Almodovar's latest film Volver winning prizes at Cannes and getting heaps of praise all over the place, it felt like the right time to revisit his work and appraise Talk to Her as the film of an auteur who seems to have finally found a voice. And the sequence featuring Caetano Velosa is stunning. Stunning, I tell you. There has not been popcorn at the last two Film Club screenings. LIES! Guilty as charged, though it is T'Cha, not I, who handles the popcorn. Still amends shall be made, for the masses have spoken. Hear My Clarion Call: come out to film club, and I'll butter your popcorn anytime.